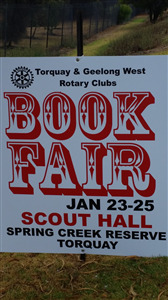 Our first ever joint book fair with Torquay Rotary. 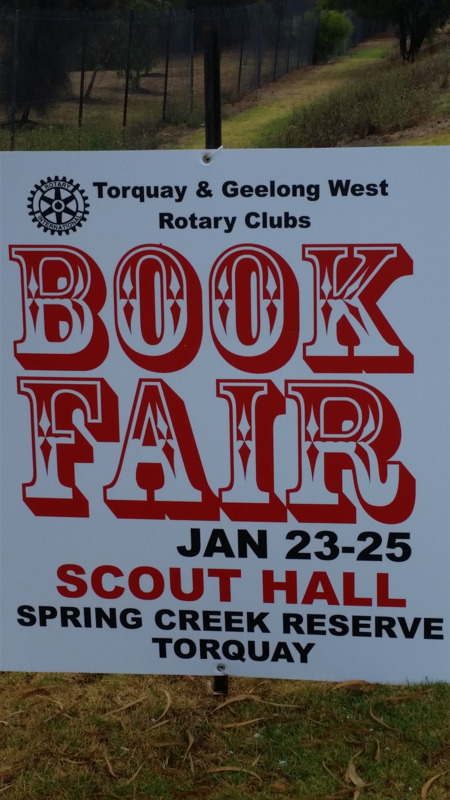 The Torquay & Geelong West Rotary inaugural book fair was a great success. At 2pm on Friday 22/1, 12,000 books delivered by Mr Zippy from Geelong West Rotary descended on the Torquay Scout hall and with the coordinated people power from fellow Rotarians and their partners, Torquay Probus, family and friends, the books were unloaded, stacked and presented for purchase. The door opened on Saturday with great anticipation and within one hour the hall was buzzing with hundreds of women, men and children searching for treasures and walking out with armfuls of books. The success of the book fair was made possible by the generous sponsorship from Coulter Roache Lawyers and Mr Peter Callan, Plastic Surgeon. Community donations of books and advertising assisted the fundraiser enormously with book donations from locals, the Torquay Book Shop and Lorne Second hand books. Ben Smith at Hayden’s Real Estate and Amanda Pickering from Rivers assisted with advertising. The success of the book fair enabled us to present a beneficial cheque to the Strive2Thrive program. Strive2Thrive is a Geelong based program, which empowers people to get back into life after cancer. The program depends on fundraising and donations to enable both men and women to access the program for free. Thank you to everyone for their hard work, another example of Rotary In Action.